Every second, 11 new people start using social media. Today, more than ever, people are using social as a way to make purchases and build brand loyalty. To stay competitive in 2019, marketers will need to think creatively about how they stand out on social networks. From internet-breaking social stunts to impeccable blending of offline and online experiences, a few brands wowed us on social media this year. #1. The best use of blending offline with online experiences. Influencer marketing is much more than simply engaging consumers online. It should also drive real-world action. A recent study shows that 76 percent of U.S. consumers have purchased a product they’ve seen in a brand’s social media post. Sixty-five percent of these people purchased the product at a later date but a full 20 percent of them bought in store, which means that social posts are driving traffic to brick-and-mortar. One of the most literal applications of this concept this year, and a genius use of influencer marketing, came from Adidas. To announce the launch of their P.O.D. shoe, they created 16 billboards in New York and LA with personalized ads targeting their specific influencer partners. 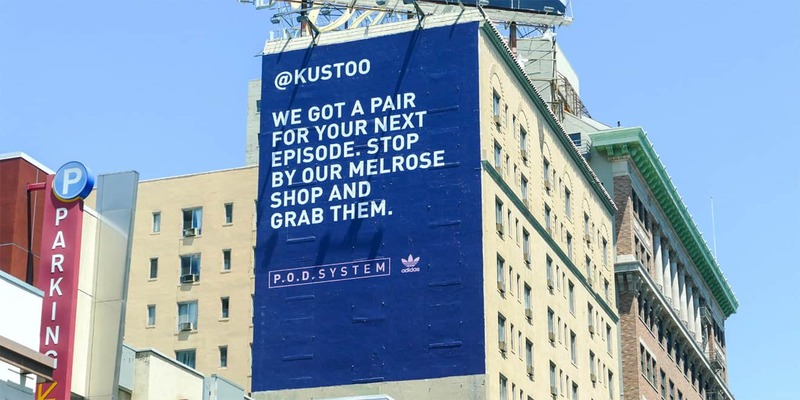 Each billboard included the influencers handle, a personal message, and a call to action for them to pick up their new Adidas at a nearby store. Adidas saw such social success that they expanded the program to additional markets. #2. The best social stunt. Consumers are spending more of their waking hours consuming digital media than ever before. Some reports claim we’re spending an average of 10 hours per day online. This year, IHOP rose above the content fray with a social stunt that rocked the online world and had us all guess what was true. IHOP announced that their iconic brand was flipping the “P” to a “B” in their name along with what would now be featured on the new IHOb menu. Ultimately, it was revealed that the switch would only be temporary and was a carefully orchestrated campaign to unveil their new line of Ultimate Steakburgers. The impact the stunt has on their overall business goals remains to be seen. What can’t be discounted is the buzz this generated for a brand that traditionally may not have stood out in the crowded digital world. Of course, we can’t have the highs without the lows. From totally tone-deaf posts to a devastating case of creative control gone wrong, a few brands ended up on our minds for all the wrong reasons. How can you learn from these missteps to create memorable content in 2019 that doesn’t tarnish your brand’s reputation? #3. The worst, totally tone deaf mistake. Through social there’s an incredible opportunity to not only involve your brand in the day’s social and political conversations, but take a stand on them. A Sprout Social study found that nearly two-thirds of consumers responded that it was either “Somewhat Important” or “Very Important” for brands to take a stand on social/political issues. While there’s opportunity to do this right, there’s equal opportunity to do it wrong. Before taking a stand on social, ensure your intended message aligns with your brand’s image. Sleepwear brand, Lunya, struck the wrong tone with a pajama set named after the lead character in the wildly popular Hulu series, The Handmaid’s Tale. Their expensive “Offred” nightgown was announced via email and Instagram and was positioned as a celebration of the character. Unfortunately, the celebratory message was way off the mark, as those familiar with the storyline will attest. Hugely negative social response prompted Lunya to delete their post and halt release of the product altogether. #4 The greatest loss of creative control, with dire consequences. As usage continues to grow across social networks, the platforms themselves are developing new ad tools to better engage consumers and provide trackable metrics to marketers. As these tools roll out and mature, brands should ensure that in the fast-paced world of content creation, creative control must always remain priority number one. Snapchat proved this tenet in March of 2018, with the now infamous Rihanna ad. An advertiser used the platform’s internal creation tools to produce an ad for a game called “Would You Rather?” The ad asked whether users would rather “slap Rihanna” or “punch Chris Brown?”. The fallout resulted in a 4% drop in Snapchat’s stock value and the advertiser was banned from the platform. Social media is an ever-changing, challenging space where creativity, risk-taking, and calls to action reign supreme. All eyes are on you and your brand in 2019. For best results, take smart risks, don’t forget about IRL, and always, always maintain creative control. Ready to jump start your content and influencer partnerships in 2019? Let’s talk.